One snowy night Arthur Leander, a famous actor, has a heart attack onstage during a production of King Lear. Jeevan Chaudhary, a paparazzo-turned-EMT, is in the audience and leaps to his aid. A child actress named Kirsten Raymonde watches in horror as Jeevan performs CPR, pumping Arthur’s chest as the curtain drops, but Arthur is dead. That same night, as Jeevan walks home from the theater, a terrible flu begins to spread. Hospitals are flooded and Jeevan and his brother barricade themselves inside an apartment, watching out the window as cars clog the highways, gunshots ring out, and life disintegrates around them. Fifteen years later, Kirsten is an actress with the Traveling Symphony. Together, this small troupe moves between the settlements of an altered world, performing Shakespeare and music for scattered communities of survivors. Written on their caravan, and tattooed on Kirsten’s arm is a line from Star Trek: “Because survival is insufficient.” But when they arrive in St. Deborah by the Water, they encounter a violent prophet who digs graves for anyone who dares to leave. Emily St. John Mandel was born in British Columbia, Canada. She is the author of three previous novels—Last Night in Montreal, The Singer’s Gun, and The Lola Quartet—all of which were Indie Next picks. She is a staff writer for The Millions, and her work has appeared in numerous anthologies, including The Best American Mystery Stories 2013 and Venice Noir. She lives in New York City with her husband. “Spine-tingling . . . Ingenious . . . Ms. Mandel gives the book some extra drama by positioning some of her characters near the brink of self-discovery as disaster approaches. The plague hits so fast that it takes them all by surprise . . . Ms. Mandel is able to tap into the poignancy of lives cut short at a terrible time — or, in one case, of a life that goes on long after wrongs could be righted." "Darkly lyrical . . . An appreciation of art, love and the triumph of the human spirit . . . Mandel effortlessly moves between time periods . . . The book is full of beautiful set pieces and landscapes; big, bustling cities before and during the outbreak, an eerily peaceful Malaysian seashore, and an all-but-abandoned Midwest airport-turned museum that becomes an all important setting for the last third of the book . . . Mandel ties up all the loose ends in a smooth and moving way, giving humanity to all her characters — both in a world that you might recognize as the one we all live in today (and perhaps take for granted) and a post-apocalyptic world without electricity, smartphones and the Internet. 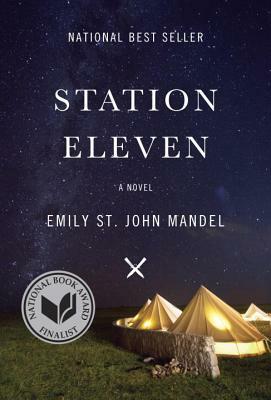 Station Eleven is a truly haunting book, one that is hard to put down and a pleasure to read." "Mandel’s spectacular, unmissable new novel is set in a near-future dystopia, after most — seriously, 99.99 percent — of the world’s population is killed suddenly and swiftly by a flu pandemic. (Have fun riding the subway after this one!) The perspective shifts between a handful of survivors, all connected to a famous actor who died onstage just before the collapse. A literary page-turner, impeccably paced, which celebrates the world lost while posing questions about art, fame, and what endures after everything, and everyone, is gone." "Haunting and riveting . . . In several moving passages, Mandel's characters look back with similar longing toward the receding pre-plague world, remembering all the things they'd once taken for granted — from the Internet to eating an orange . . . It's not just the residents of Mandel's post-collapse world who need to forge stronger connections and live for more than mere survival. So do we all." "Emily St. John Mandel’s fourth novel is, flat-out, one of the best things I’ve read on the ability of art to endure in a good long while. It’s about the ways that civilization is kept alive in a world devastated by a plague, sure, but it’s also about the way artists live, about the way people live, about flawed relationships and creative pursuits and how the unlikeliest of connections can bring transcendence." "Enormous scope and an ambitious time-jumping structure, Station Eleven paints its post-apocalyptic world in both bold brushstrokes and tiny points of background detail. As the conflicts of one era illuminate another, a small group of interrelated characters witnesses the collapse of the current historical age and staggers through the first faltering steps of the next . . . [A] powerfully absorbing tale of survival in a quarantined airport and on the dangerous roads between improvised settlements, protected by actors and musicians trained for gunfights. Mandel has imagined this world in full, and her ambition and imagination on display here are admirable." "Audacious . . . A group of actors and musicians stumble upon each other and now roam the region between Toronto and Chicago as the Traveling Symphony, performing Shakespeare — “A Midsummer Night’s Dream,” “Romeo and Juliet” — for small settlements they find in the wilderness. Their existence alone provides the novel with a strange beauty, even hope, as one actress notes how these plays survived a bubonic plague centuries ago . . . Station Eleven is blessedly free of moralizing, or even much violence. If anything, it’s a book about gratitude, about life right now, if we can live to look back on it." "Station Eleven . . . I couldn't resist . . . You should read it, too . . . It'll make you marvel at the world as we know it . . . [and] remind you the people who drive you the most crazy are perhaps also the ones you don't want to live without." "Mandel comes by a now-common genre mash-up, highbrow dystopia, honestly, following three small-press literary thrillers. By focusing on a Shakespeare troupe roving a post-pandemic world of sparse communities, she brings a hard-focus humanity to the form. Repeated flashbacks to the life of an early flu victim, a Hollywood actor who dies onstage in the character of Lear, provide both comic relief and the pathos of a beautifully frivolous world gone by." "In this unforgettable, haunting, and almost hallucinatory portrait of life at the edge, those who remain struggle to retain their basic humanity and make connections with the vanished world through art, memory, and remnants of popular culture . . . a brilliantly constructed, highly literary, postapocalyptic page-turner." "This fast-paced novel details life before and after a flu wipes out 99 percent of the earth's population . . . As the characters reflect on what gives life meaning in a desolate, postapocalyptic world, readers will be inspired to do the same." "Station Eleven is a magnificent, compulsive novel that cleverly turns the notion of a “kinder, gentler time” on its head. And, oh, the pleasure of falling down the rabbit hole of Mandel’s imagination -- a dark, shimmering place rich in alarmingly real detail and peopled with such human, such very appealing characters." "Her best, most ambitious work yet. Post-apocalyptic tales are all the rage this season, but Mandel’s intricate plotting and deftness with drawing character makes this novel of interlinked tales stand out as a beguiling read. Beginning with the onslaught of the deadly Georgian flu and the death of a famous actor onstage, and advancing twenty years into the future to a traveling troupe of Shakespearean actors who perform for the few remaining survivors, the novel sits with darkness while searching for the beauty in art and human connection." "A unique departure from which to examine civilization's wreckage . . . [a] wild fusion of celebrity gossip and grim future . . . Mandel's examination of the connections between individuals with disparate destinies makes a case for the worth of even a single life."